I still remember the Planning and it all started somewhat like this, I have been all bored with a year of work and almost no Holiday or break from the office job. Whatever holidays I took were just small two or three day’s gaps for festivals and Sundays. I was so pissed-off with the heavy headed task that I finally decided to quit Job for next 2-3 months and since my decisions’ are always at a short notice, I did quit my job. 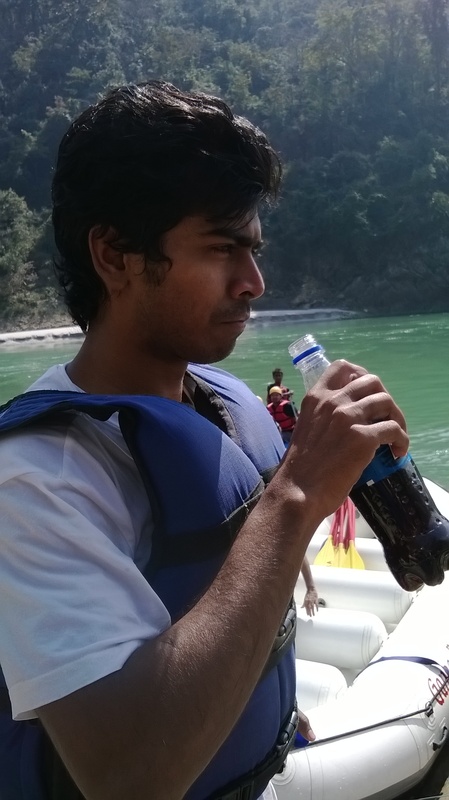 After finally leaving the office, I decided to take out time for my passion and that is travelling, I went around to several places in these two months including Delhi, Himachal and others but the trip to Rishikesh and the rafting there was so magical that I am still dwelled in the fever and I am sure I am never gonna come out of it. After returning from the shopping trip to Delhi, I and one of my friends who along with me did quit the Job were planning our next adventure. Suddenly we decided to get out for a rafting trip, since it was the start of spring the weather was perfect for our choice. Now rafting was our choice for adventure, the place was yet to be decided. Hmmm we were thinking of Manali, no we have already been there many times, then the second name in our mind came was Zanskar, a place in ladakh, yes definitely it will be a hell of adventure, but then no we are not left with a lot of time so that last choice which I am thankful we finally decided for was Rishikesh. A place famous for its temples and holy rivers is also an exciting hub for adventures. 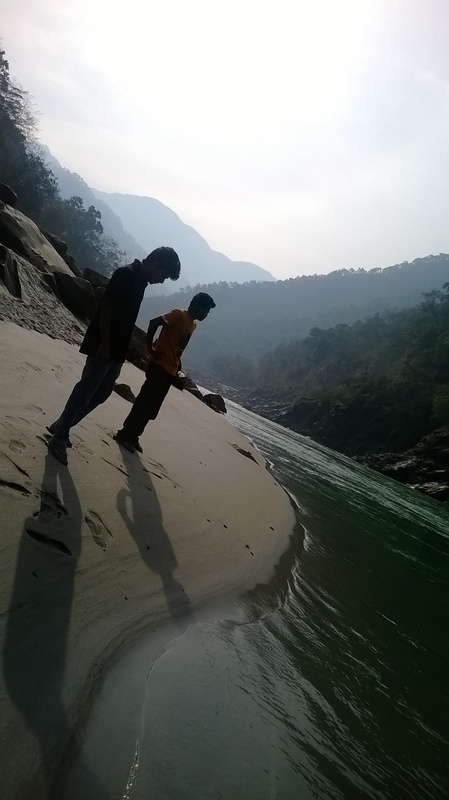 Huge mountains, dense forests and rivers running out of them, what an exciting combination for a perfect holiday! The next step was the departure, we had not planned it at all and I’ll tell you something, unplanned journeys are always way better and more fun. 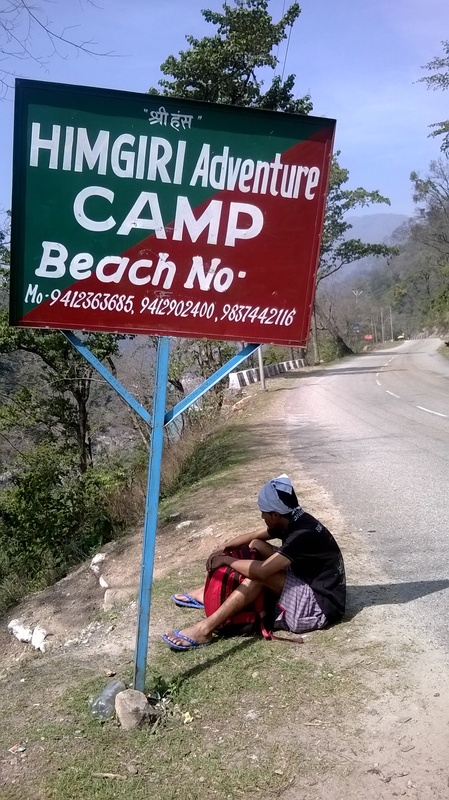 We packed all our essentials and reached the bus stop, and to our surprise there were no luxury buses available for Rishikesh and the ones available were already full. We decided to call for a cab, when a thought struck in my mind why not try a local bus this time. We got on the bus standing in front of us saying “Uttranchal Parivahan Nigam”. The driver drove us all the way to Rishikesh through the rough roads. The Journey lasted for eight hours. A small delay was made due to some engine problem in the bus. We also had a stop in a Dhaba for snacks and Lunch. 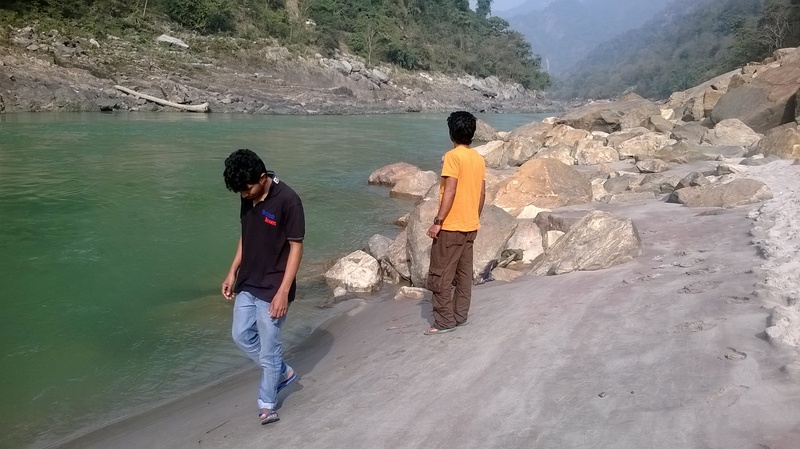 At last it was around 6 in the evening when we reached Rishikesh. The next question was definitely the stay and we chose to take a camping rather that the hotel. So the night was somewhat like this. 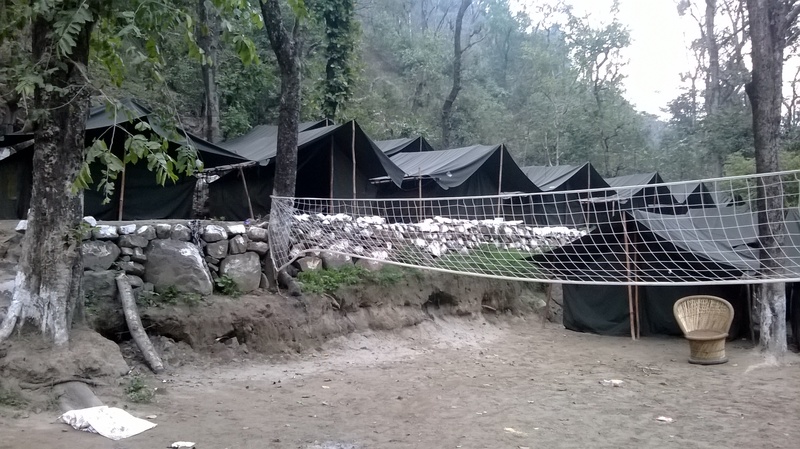 We drove all the way through the roads between the mountains to the Shivpuri river side camp, where there were tents laid in line. We were given a tent and a lantern. Yes, you read it right a Lantern, there was no electricity as it was at a high altitude, no mobile networks Nothing. But it was all a fun. We were welcomed with a delicious snacks consisting of pakoras of all kind, peanuts with salted onions and tomatoes made delicious in their own ethnic way and the sweet and hot tea. After the long bus drive it was an awesome time. Sitting beneath the open sky watching the stars and enjoying the hot tea It just refreshed me. I was enjoying the moment with my friend, sipping the hot tea. Since it was just the mark of springs the nights at such high altitude were too cold. After an hour or something all the camping groups around gathered together to enjoy the bon fire and the beach volleyball. 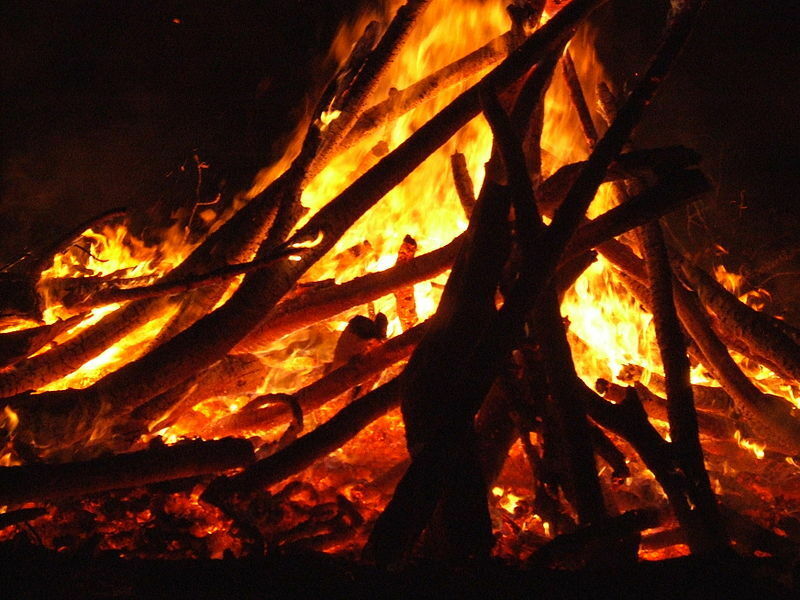 I just sat beside the fire and enjoyed watching them. The night was already exhausted with the journey and we decided to take rest. We had dinner which was a fab, so delicious and mouth watering. I was really amazed at the way they presented things at a place like this where finding essentials was also so difficult. Everything was managed so smoothly. Though I have never had the habit of getting up so early in past few days, I don’t know how, but I woke up at 5:30 in the morning, the sky was red in hue and the sun was yet to come. I woke up my friend and we went down the rocks to sit beside the river and watch the sun rise. Not to forget it was not any normal day, but it was March 17th 2014, the occasion of Holi which we were enjoying in a unique way. The sun came up around 6 and we loved the aura. It was freezing outside as it was early morning. Rather than taking the morning raft we chose to take it in noon when the river is wilder. Meanwhile we enjoyed trekking around the forest and the river. Everything was so lovely. It was around 1PM in the noon when a car took us to the height from where we started our rafting. 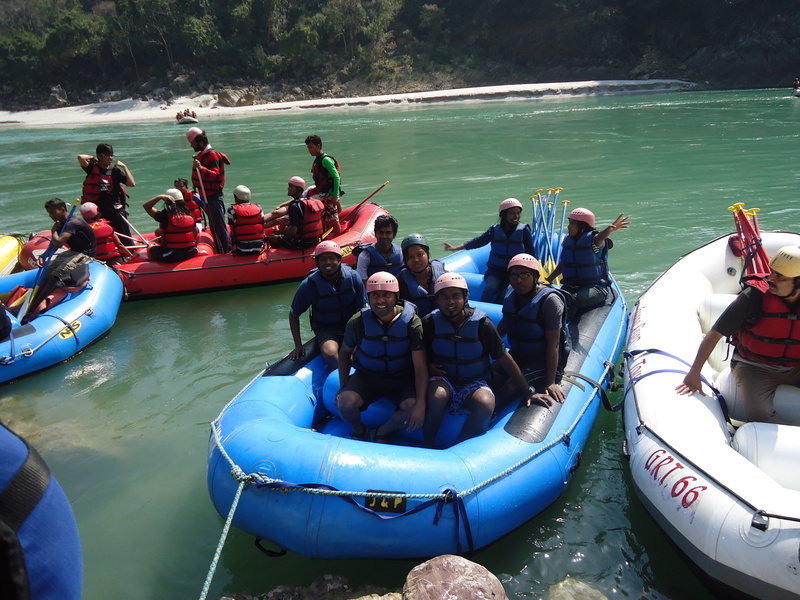 The rafting was for 20KM of distance and was awesome in one word. We had special instructions from the people guiding us in the raft and yes the group we sat with was also amazing. I do not exactly remember the name for the Rapids, in our way but my personal favorite was the Body Surfing Rapid. We were allowed to surf in the river water which was amazing. I couldn’t stop laughing and was really not in a mood to get up on the Raft back. There were around 9 Rapids and the fun can never be brought down to the paper. Also we halted on a stop known as Maggie point, where there was a waterfall and we were allowed to take a freefall from the mountain. So it was another adventure. Definitely we were in no mood for the Maggie and we got back soon and enjoyed the rapids ahead. 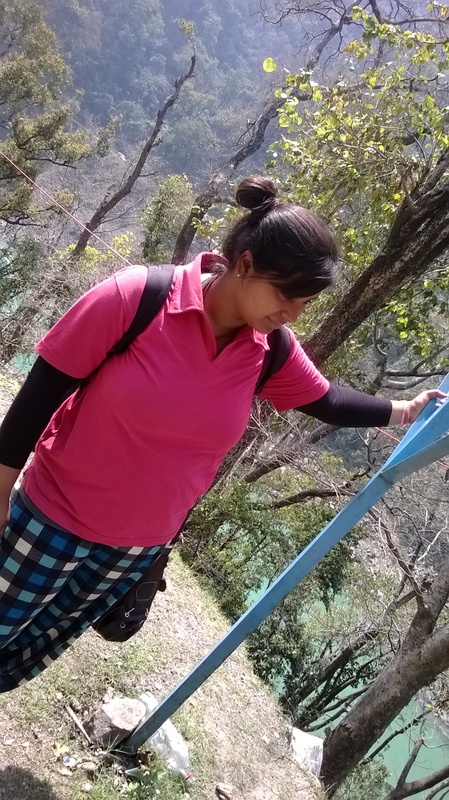 After the halt there were more rapids and one was a double rapid where two rapids were is succession and finally the rafting ended at the Lakshman Jhula. And with this our adventure was ended and became an everlasting memory for us! 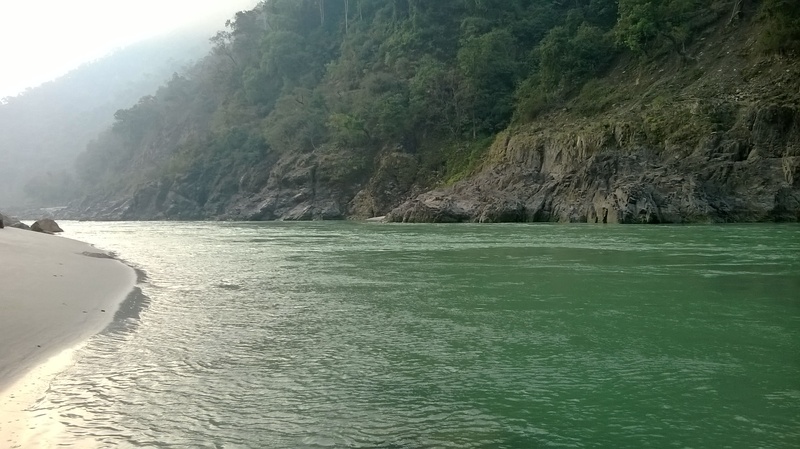 I know after reading this you might be planning out your trip to Rishikesh and if you are, I will say, YES PLEASE! There is no way you are not gonna fall in love with this adventure. For me it became my favorite trip. I hope you enjoyed the images and the trip with me. Have a good weekend all! Previous PostAmazing National Parks around the World!Next PostSafari Forests and its Trip!